A while ago, I mentioned a public call for resumes for Forrester’s Community Manager role, we even heard from the hiring manager, Michele Frost, who is our ‘web strategist’ responsible for our corporate website. I’m pleased to introduce you to John Cass, who’s in Boston, has a long background with SNCR, has done research (making him a good fit for the culture) and is an all around nice guy. 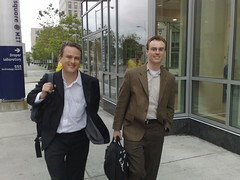 I enjoyed having him in my recent social computing workshop class in Boston, then went to dinner with him and our new Australian analyst Steven Noble (also focused on marketing with a focus on social computing). Read from John himself why he chose to join Forrester, and how he’s going to use these tools to connect with our customers, so we can provide more value to our clients. You can also find him on Twitter. If you wanted to learn more about community managers, read all my posts tagged community manager, or if you seeking to become one, or hire one, start here at On the Move. Lastly, thanks to all who submitted resumes, I wish you the best of luck going forward. Recently, I published a report called How to Hire for Social Computing, it indicates what management should look for, how to manage them, and how they should think about compensating them. Just over a week ago, I put out a call to the industry that we were hiring a Community Manager. Because I was a Community Manager and write about it frequently, I received an above normal response rate, 19 Resumes were submitted. Keep in mind, that some of these folks are not community managers, but they’ve all aspired to be in the role. What Industries did they come from? Most have a BA or BS, followed by many with MBAs and a handful without a degree. Interesting, I fit almost exactly into that persona: 9 years exp, Marketing exp, from Tech, and Bachelor degree. I’ve been presenting in public at conferences or webinars my high level findings from my recent research on Online Community Best Practices, the detailed version is on the Forrester site. I interviewed 17 companies and leaned on my experience launching the social media programs at previous companies. You can view the powerpoint on Slideshare. The next time I’m presenting this is in Mountain View on March 25 (yes it’s open to men too), discount code for $50 off for Web Strategy readers is SNC325. It seems counter-intuitive for me to share these presentations on the web as I’m often hired to present these to clients or at conferences, or hired for advisory, but in today’s social media world, my presentation has already been filmed, blogged, and talked about around the industry. The real value comes from the explanations and and insight from a researcher presenting their findings. I’ve noticed an influx of the $100 Flip cameras (many received them free as giveaways), I spotted 1-3 of them in every panel I spoke at at SXSW, as well as half a dozen in the bloghaus. Cell phones have on board video, and can upload to the web in seconds. See, even analyst firms are impacted by changes that social media tools bring us. Information can’t be hidden, it simply hasn’t been published online. The key is to learn to let go to gain more, learn how to offer additional value that a .PPT or a YouTube video can never fulfill. I look forward to presenting at your event! Update: I forgot to include “Forum One Networks” as one of the companies included in the report. I can’t update this version (I tried on slideshare) and since it’s already being spread, I’m not going to update it, but for future iterations it will be updated. I write for the web strategist (web decision makers at companies) and was really pleased that we got a top notch professional here at named Michele Frost here at Forrester Research. A few weeks ago, I announced that Forrester is seeking a Community Manager, and wow did we get a response, over 20 resumes! The custody battle is over! After much debate, I’m thrilled to say that Forrester’s newly created position of Online Community Manager will be part of the Web Marketing team. We’re plugged into the business and work online, so it’s a solid starting point. With Jeremiah’s input, we drafted a job description and spread the word. Now comes the hard part: We need to hire. My first hiring experience was my worst: It came to a crashing conclusion with my new employee leaving the office via a stretcher within two weeks. She left behind extensive literature on how to collect workers compensation. Lesson learned. My methods have since improved, which is lucky for me, my employer, and my new employees. Recent new hires have even been quoted as saying that their job matches the job description outlined during the hiring process. Progress. Everything is different in this 2.0 pond. How do you quantify Facebook friends and LinkedIn connections? The personal and professional line is blurred on candidates’ sites and I end up knowing more than I should (or care to) about candidates’ positions on religion, gay marriage, reproductive rights, and music. Later today, I meet with Forrester’s recruiter: We’ll see how current hiring and legal counsel from Strategic Growth maps with the times. Jeremiah: It’s interesting that Michele learns a 360 view of candidates online lives, not just the resume that they put forth, truly a sign of the times. For those that applied, this is a good example of how we’re trying to be transparent, we’re real live people, as we expect you to demonstrate to our customers and clients. And I can promise you, we’ll do everything we can to make sure no one leaves on a stretcher!